ISIS militiamen have attacked predominantly Christian towns, including Qaraqosh, the most important Christian city in the north. Mar Sako makes an appeal, speaks of "a real risk genocide." As Churches are desecrated, ancient manuscripts are destroyed. The "power vacuum" in Baghdad is helping Islamist expansionist ambitions. Baghdad (AsiaNews) - "ISIS militants attacked with mortars most of the villages of the plan of Nineveh, during the night of 6th-7th of August and now they are controlling the area. 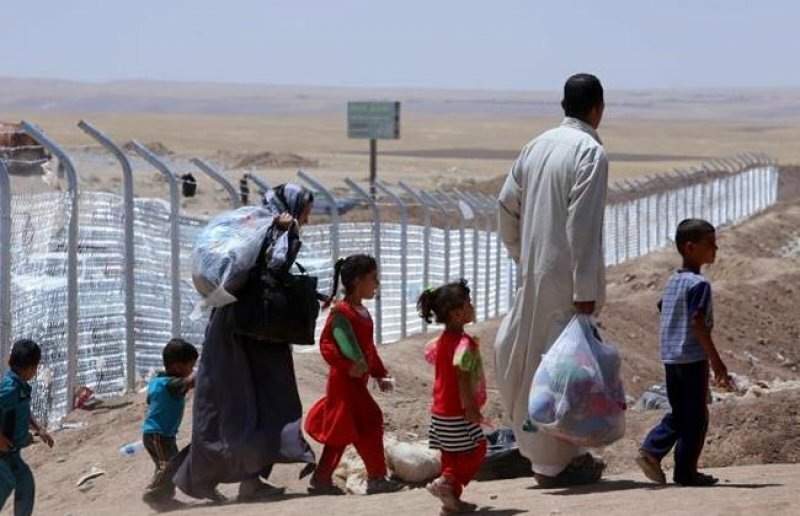 The Christians, about one hundred thousand, horrified and panicked fled their villages and houses nothing but with the clothes on their backs," writes Chaldean Patriarch Mar Louis Raphael I Sako in his appeal to AsiaNews. "An exodus, a real via crucis" is how he describes the plight of Christians, who "are walking on foot in Iraq's searing summer heat towards [salvation in] the Kurdish cities of Erbil, Duhok and Soulaymiyia, the sick, the elderly, infants and pregnant women among them. They are facing a humanitarian catastrophe and a real risk of genocide. They need food, water and shelter ..."
As days and hours go by, the situation of Iraqi Christians becomes ever more tragic, driven from their homes and land as a result of the unstoppable advance of the militias of the Islamic State (formerly known as the Islamic State of Iraq and al-Sham, ISIS). Mosul, the first city to fall into the hands of Sunni extremists, was followed by several others in the north, in the plain of Nineveh, like Sinjar, Telkef, Batnaya and Telleskuf. Here Islamist militias were quick to set up a de facto Caliphate and impose strict Sharia rule, forcing minorities to flee or pay the poll tax - the jizya - normally imposed on all "infidels". In an escalation of violence and terror, Jihadists managed to take over Iraq's largest Christian town Qaraqosh and surrounding areas. Speaking about the situation, Mgr Joseph Thomas, Chaldean archbishop of Kirkuk, said, "the towns of Qaraqosh, Tal Kayf, Bartella and Karamlesh have been emptied of their original population." "It's a catastrophe, a tragic situation," the prelate said as he appealed to the Security Council of the United Nations to intervene "immediately" because "Tens of thousands of terrified people are being displaced as we speak, it cannot be described". Sources told French NGO Fraternité, that ISIS militants Isis fired mortar rounds, killing three people, including a ten-year-old child. Reports from the Arab country make the appeal made yesterday by the Chaldean Patriarch to Pope Francis that more urgent. In it, Mar Sako blames superpowers for their "selfishness", which has aggravated Iraq's plight. With regards to churches and church property in the villages now occupied by ISIS, the patriarch writes today, "we have reports of destruction and desecration. The old manuscripts and documents (1500) are being burnt." For the Patriarch of Baghdad, the central government is "incapable of enforcing law and order in this area of ​​the country." His Beatitude has also "doubts" about the actual capacity of the Kurdish authorities to stop the "advance of the jihadists." "Clearly," he writes, "there is lack of cooperation between the Central Government" and the autonomous government of the Kurdish region. And ISIS is using this "vacuum" to "impose their rule and terror." Hence, "There is a need of international support and a professional, well equipped army. The situation is going from bad to worse." The patriarch goes on to say, "We appeal with sadness and pain to the conscience of all and all people of good will and the United Nations and the European Union, to save these innocent people from death. We hope it's not too late!"